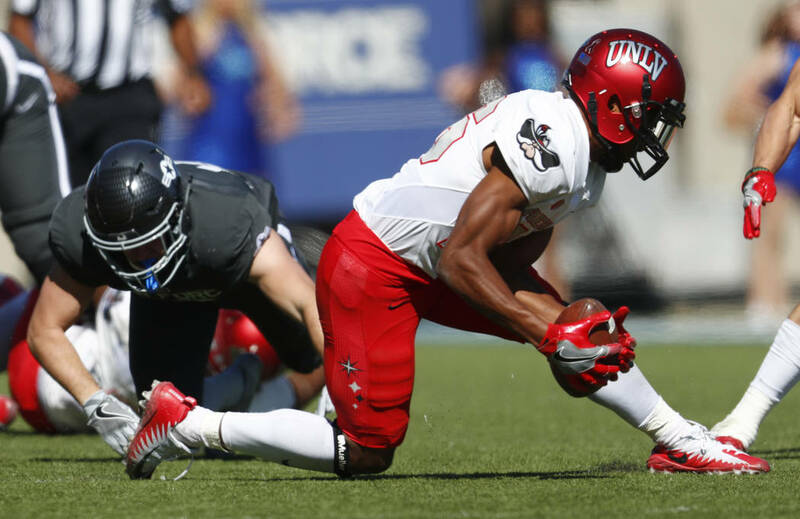 The football gods gave UNLV every opportunity to win on Saturday afternoon against the Air Force Academy Falcons. 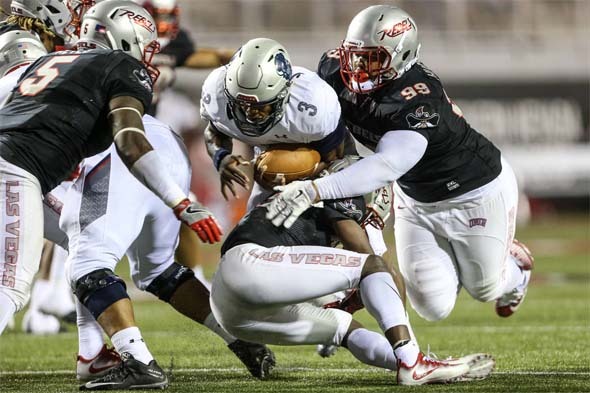 The whole game was defined by fumbles, and virtually all of them bounced in UNLV's favor. 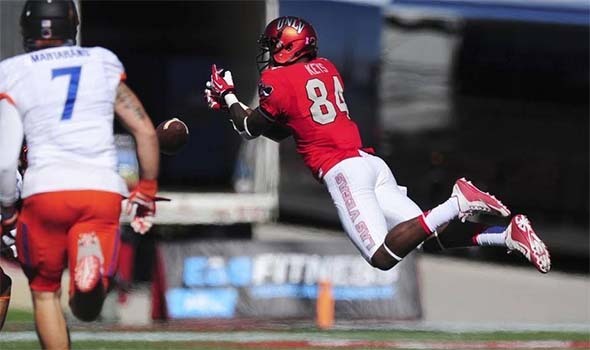 Half a dozen Air Force fumbles were recovered by UNLV. Air Force botched a field goal snap. There was even a gust of wind that pulled a kickoff such that it hit the ground in front of the returner and then bounced backwards right into the hands of the incoming UNLV coverage team -- which was either the craziest fluke play that I've seen in a long time, or it's the most genius onside kick that I've seen in a long time. 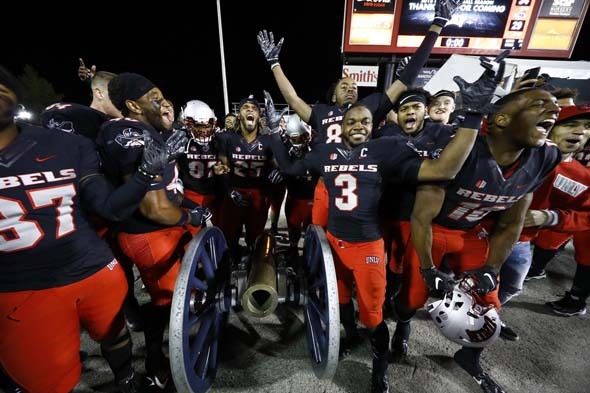 The game was defined by fumbles, and UNLV was the beneficiary of almost all of them! UNLV's 27-7 halftime lead wasn't really a case of them beating Air Force. The ball was literally being gift-wrapped (sometimes by Air Force, sometimes by blind luck) and handed to UNLV. They were the beneficiaries of constant mistakes by Air Forces and lucky bounces. But this undeserved lead also wasn't enough to guarantee the victory, as I smelled trouble as soon as UNLV stepped onto the field in the second half. The offense failed to move the ball, and the defense couldn't slow down Air Force's triple option attack. Even though the defense got plenty of rest in the first half of the game due to Air Force's constant fumbles, they still looked exhausted throughout the second half of the football game. 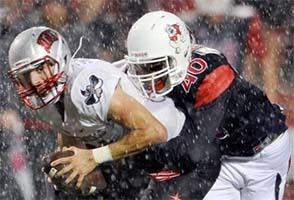 Every year, I hope that UNLV's football team will show some improvements. That it won't repeat the same mistakes that it's made year after year. But every year, UNLV finds a way to let an easily winnable game slip away early in the season, setting a tone of disappointment for the entire season. Usually, UNLV at least gets its first game or two against a power conference team and gets to raise an illusion of optimism by playing surprisingly well until they inevitably get overpowered in the fourth quarter. Cam Newton's little brother, Caylin, thrashed UNLV with his legs in a 43-40 upset. But this year, the tone-setting upset couldn't even wait past week one. In fact, it couldn't even make it past the first play of the season. UNLV opened its 2017 season by going offsides on the opening kickoff. They went on to play a mistake-filled game that Howard University exploited to a 43-40 victory -- the biggest upset against a point spread in college football history. A $100 bet on Howard to win outright would have won you $55,000. UNLV lacked discipline, committing multiple procedural penalties that killed drives and put UNLV in a hole early. 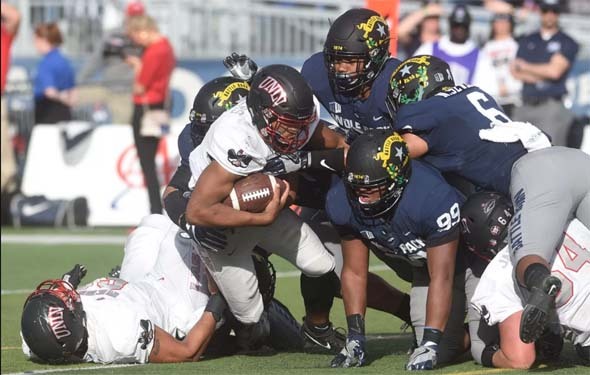 They lacked energy and couldn't contain freshman quarterback Caylin Newton (Cam Newton's younger brother) who dominated UNLV with his running ability. And UNLV gave up back-breaking fumbles that prevented momentum from swinging back in their favor. UNLV seemed to have a lot going for them going into this season. UNLV had one of the top running games last season. The defensive line is supposed to be improved. Star receiver Devonte Boyd is back from a severe injury that prematurely ended his 2016 campaign, and he has a hyped up freshman quarterback throwing him the ball. The offense did show some promise. Rogers and Boyd connected on some big passes, and the running game looked pretty good. They even met their goal of 40 points per game! Armani Rogers and Devonte Boyd hooked up for a couple big plays. 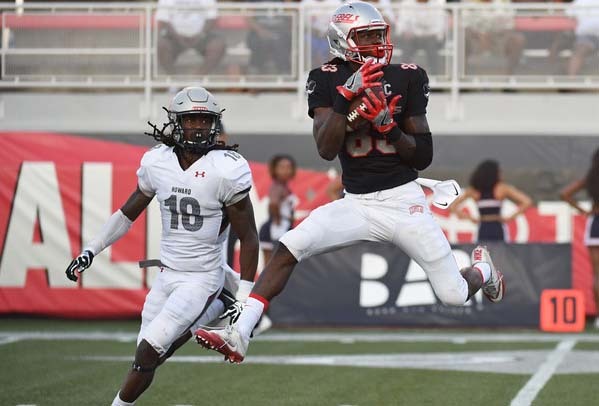 UNLV football fans were riding high earlier last month after the team's record-breaking victory against Idaho State, and the nail-biting victory against rival Nevada the following week. UNLV was going into a pair of winnable games against Mountain West opponents San Jose State and Fresno State, and there was a very real possibility (and expectation) that UNLV could go 3-0 in Mountain West play and go into last week's Boise State game to determine first place in the conference. I don't think anybody expected that UNLV could have beaten Boise State, but Boise's debacle against Utah State certainly left doubts about that team's ability. But it doesn't matter, UNLV managed to blow the games against San Jose and Fresno in the fourth quarter. A potential 4-3 start to the season fell to a pathetic 2-5, right in line with pre-season predictions from skeptics. UNLV has certainly shown that they have the ability to play well and win games, but in traditional UNLV fashion, they still can't muster up the discipline to pull through at the end of the game. 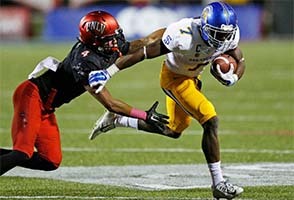 UNLV blew two fourth quarter leads to San Jose State and Fresno State to fall to 2-5 on the season. The overtime loss to San Jose State was pretty heartbreaking. Watching UNLV completely fail to cover that last-minute screen pass for the game-tieing touchdown was a punch in the gut. A win would have given UNLV a respectable 3-3 record overall, but instead, they walked out 2-4. The team put up a good fight, especially considering the limitations of backup quarterback Kurt Palandech. The comeback effort was admirable, but UNLV just couldn't get it done in overtime. The following week's game was probably more disappointing. UNLV walked into the fourth quarter with an 11-point lead over Fresno State and looked to have the game well in hand. 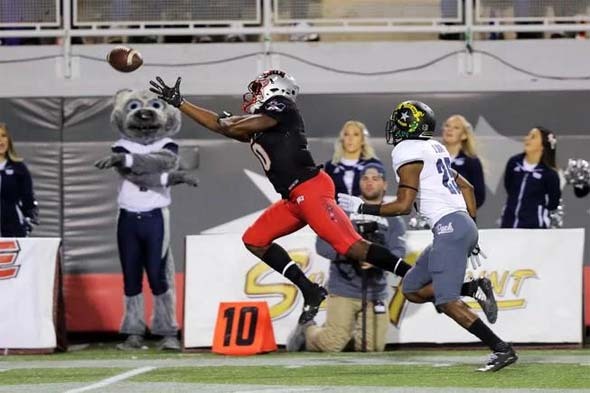 But the offense just couldn't execute in the fourth quarter, and the Bulldogs managed to put together a couple scoring drives to strip the victory from between UNLV's fingers. A lot of the expectations for the team were squashed going into the game against Boise State, but I still held out some hope for a surprise upset. Starting quarterback Blake Decker was back from injury, and Boise looked vulnerable to mistakes. If UNLV's defense could contain Boise's offense, then UNLV might have a chance. Unfortunately, UNLV's defense just couldn't do enough. Boise cut through UNLV's defense like butter in the first quarter, putting together three scoring drives to open the game. In the meantime, UNLV's offense sputtered thanks to a proliferation of dropped passes. Dropped passes prevented UNLV from sustaining drives in the first quarter against Boise.